These are delicious - and I don't like kale! I feel good eating them because I know they're good for me and I love the taste! Strip the kale leaves from the stem and tear into small pieces 1-2"
In a blender or food processor put all the rest of the ingredients and puree until smooth. Add the water if you need it. I use a Ninja 1100 Kitchen system and doesn't need the water - it just means it dries faster! Use your hands and squish the cashew cream all over the leaves and onion. Don't be afraid to get messy and make sure everything is well coated. 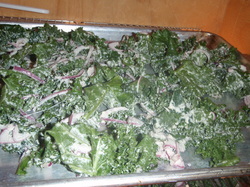 Spread the kale in dehydrator and dehydrate at 105' until they are crispy and dry. My homemade dehydrator doesn't get that warm and takes 48 hours or so. Commercial dehydrators should take about 12 hrs. Store in an airtight container - I have no idea how long it "lasts" because it doesn't last in my house! 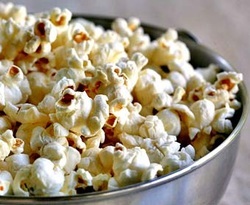 Popcorn - Salted or Seasoned! I am always looking for simple - and quick snacks that are whole foods, gluten free, dairy free and cheap is a great bonus!! 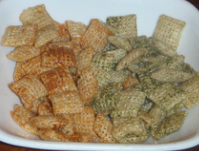 Pour it over the cereal in a bag and shake to coat. Let it sit for a little while to let the oil soak in.